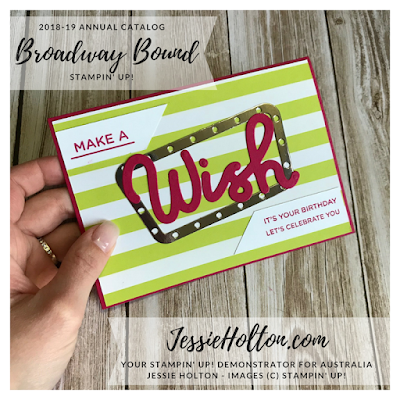 Today I'm showing you the Shaker Card we made for my Stamp Camp using the Broadway Bound Suite. I have started with a layer of the Designer Series Paper on a Lovely Lipstick cardstock base & adhered the center part of the Silver Foil die cut. Then I've adhered the Window Sheet to the Silver Foil frame die cut & trimmed the excess. Next I've used a long Foam Adhesive Strip around the frame edge. 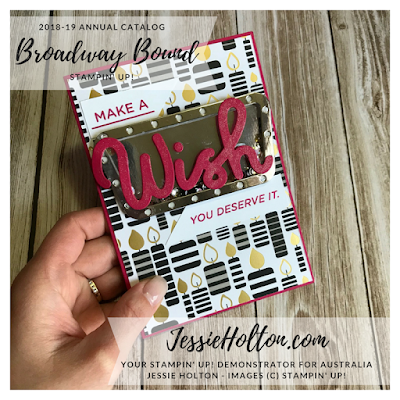 I've added a pinch of Metallics Assortment Sequins onto the silver center part on the card base & adhered the window down over the top. I've also die cut the 'wish' sentiment in Lovely Lipstick, first putting Adhesive Sheet over the back (before die cutting) so all you need to do is peel & stick. I've painted Wink of Stella over the 'wish' sentiment. I've stamped the sentiment in Lovely Lipstick on a long white piece of cardstock & then cut it diagonally before adhering to the card. This second card could easily be stepped up to a Shaker Card as well. This is using another piecce of the Broadway Bound DSP.